Creating a simple, festive home for the holidays. Among the multiple things on our to-do list at this busy time of year, decorating our homes is a high priority for many of us. We want our homes to reflect this exciting and celebratory time of year yet be festive, welcoming and cozy. 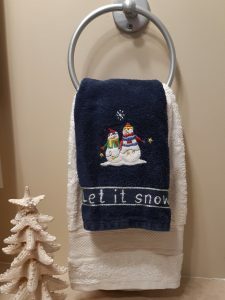 But with all of the shopping, baking, entertaining, card and letter writing and parties, it is easy to get overwhelmed and run short of time to add Christmas touches to the rooms in our homes. Christmas decor does not have to be elaborate or complicated to be beautiful. Simple decor is much more elegant and brings a peaceful calm to any space; busy, over done rooms have a frantic feel to them and do not create a relaxed ambience. 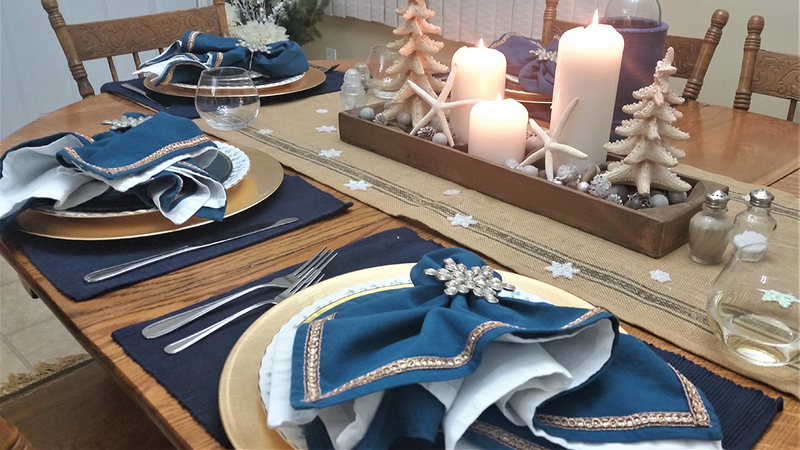 To help you create a simple, festive home for the holidays, read on for quick and easy tips to bring a touch of Christmas to each of your rooms. The living room and/or family room are the spaces that typically see the most use in our homes and Christmas is no exception when family and friends gather to celebrate. Traditionally the Christmas tree is located in these rooms, but whether you have a tree or not, there are simple ways to add some festive touches to these spaces. You want to make these rooms welcoming and comfortable but keep them low maintenance as well, so you can enjoy the visit with your guests. The addition of throw pillows with seasonal motifs, colours and textures is one of the easiest updates to make, especially if paired with a cozy throw or two. A simple display of candles of varying heights and sizes intermingled with greenery can be placed on a mantel, shelf or coffee table and works well into the new year too. Using faux greenery is a low maintenance approach and the range and quality has dramatically improved over the past few years! The dining room will be the centre of many a meal and celebration over the holidays. 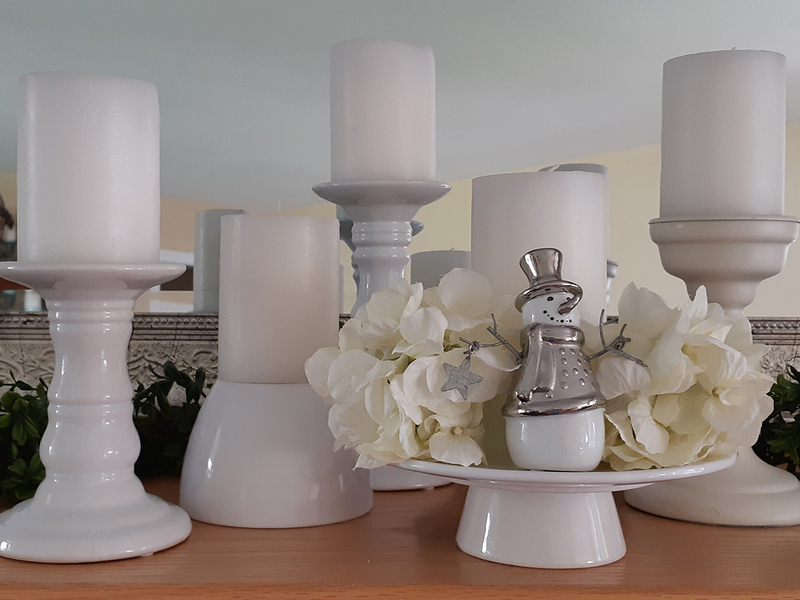 Keep things simple with a centrepiece that is a focal point at each sitting and does not have to be removed to make way for the place settings and dishes of food. Natural elements such as small pine cones, stones or nuts, candles (unscented) and Christmas ornaments all set in a tray or on a platter make a simple but elegant display. Use colours that coordinate with your table linens and dishes and you will have a beautifully pulled together table every time with minimal effort. While you want to ‘keep the decks cleared’ in the kitchen for the cooking and baking that you do during the festive season, a few touches of Christmas bring a homey, comfortable vibe to this central hub. 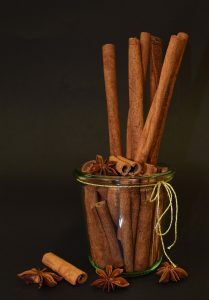 A simple jam or mason jar with a festive ribbon and cinnamon sticks not only looks lovely but smells terrific too! Equally festive and easy is a basket or bowl filled with nuts, clementines or pomegranates. Of course, who could resist a delightful colourful cookie jar that not only adds charm to your kitchen but holds some of those treats you have prepared! Throw pillows are a simple and easy way to add Christmas to the bedrooms and your guests will love this festive touch! Pillows are readily available in a variety of colours, styles, fabrics and patterns so you will easily find the perfect ones to coordinate with your decor and style. Christmas ornaments are not just for the tree. Casually set on a shelf or gathered in a bowl or on a small plate on a dresser, ornaments bring colour, texture and a touch of sparkle to the room. Ornaments are also available in such a wide variety of styles and colours, you will easily find the perfect ones if you don’t already have some in your collection! The entrance way to our homes is where we set the stage and make guests feel at once welcome and comfortable. If you have a table in the entrance way, a jar of seasonal greens or dogwood branches makes a simple display and a ribbon wrapped around the vase makes it even more festive! And how about bringing a wreath indoors? Even the smallest of entrance ways can be made festive with a small wreath. Of course, Christmas cards provide a perfect decor accessory and clipping them to a brightly coloured ribbon is a simple way to add more colour to the display. As we head into the busy Christmas season I hope these ideas prove helpful and provide the inspiration to make some beautiful but simple and easy additions to your home for the holidays. Cheers! Janet Armstrong (simplyswankdecor.ca) is a graduate of the Interior Design Institute of Canada, CAPS (Certified Aging in Place Specialist) and a Director and Membership Chair with the Board of the Decorators and Designers Association of Canada (DDA Canada).